The Good Doctor season two will be here shortly, but in the meantime, you can rewatch all your favorite moments from the last season. Season one is now available on DVD from Sony Pictures Home Entertainment, and it features a few exciting additions including a gag reel, behind-the-scenes features, and a few deleted scenes like the one above. In this exclusive clip from the episode "She," we get a closer look at the work rivalry between Shaun (Freddie Highmore) and Morgan (Fiona Gubelmann) as the two fight over an ultrasound. 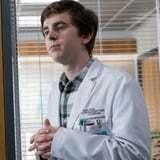 See how Morgan winds up outsmarting the good doctor, and be sure to tune into The Good Doctor when it returns on Sept. 24.